Here is Kathy's daughter Shelby coming out of my printer. I thought Kathy would love to see what the photo looks like before it gets to her house. THAT IS WAY COOL !!!!!!!! Thanks Kathy.... It will be in the mail to you tomorrow!!! I hope you and Shelby enjoy it as much as I had fun printing it for you. You can't beat a big one!! WOW - what a great photo of a photo. Looking great there Kathy and Tracy! Shelby will be over the moon! What kind of printer do you have Tracy!? I have an Epson Pro 4800. 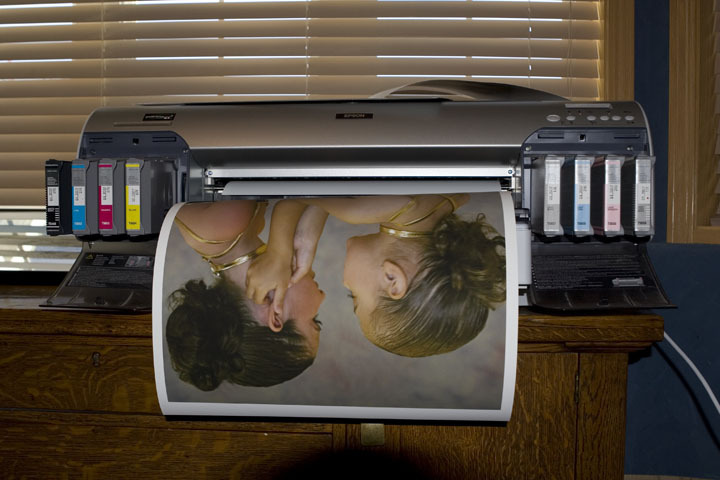 It is a wide format printer, where I can print images up to about 16 inches wide. The longest thing I ever printed was a pano that was 56 inches long.